Learn all about kinetic art in this hands-on experimental workshop that will introduce and explore the low-tech creative power of cams and cranks which are powered by hand. Learn how to construct a basic cam and crankshaft mechanism using pre-made wood and metal components. 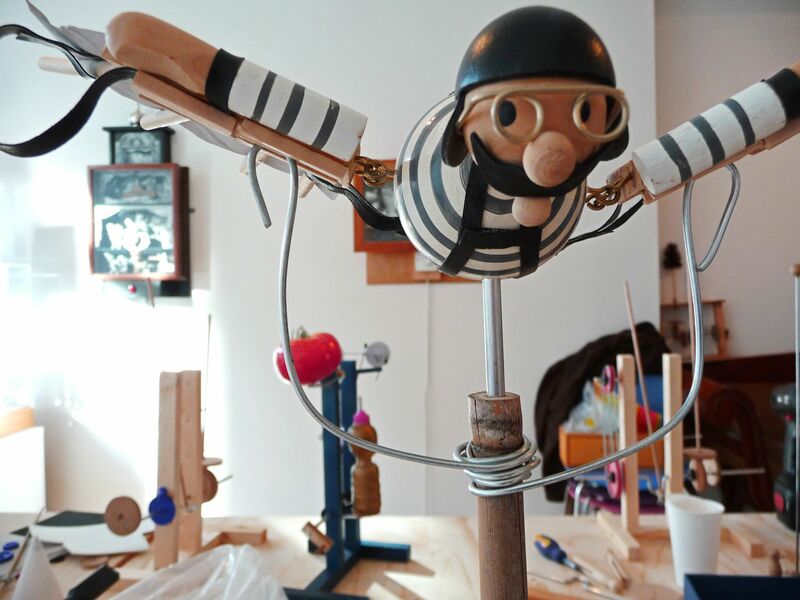 This will form a creative springboard from which you can design and construct your own kinetic artwork or automaton. Inventiveness, humour and experimentation are encouraged, and creative ideas will be sparked by playing around with the movements and harnessing their intrinsic characteristics. You will have the opportunity to learn how to use a range of tools, such as a pillar drill and scroll saw. Ticket price includes all materials, however participants are also welcome to bring their own tools and any materials, objects or bits of junk that could be used in the artwork. I am a Silversmith and I have made a few music boxes with simple movement in miniature scenes and I want to learn how to make more active scenes with finer movement. Do you have any detailed courses coming up? Nothing at the moment. Workshops tend to happen in association with exhibitions. You can subscribe to our newsletter or the blog. Greetings from your fan from India. 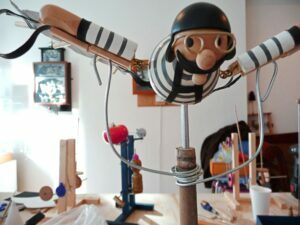 I have been an amateur woodworker and would like to get information and your tips to make wooden automata, I am a grandfather to four children and they love the tinkering that I do with my basic skills. Will appreciate if you could send some pdf plans to allow me to use them and improve my craft work. Sorry we don’t have a regular workshop schedule. They mostly happen around exhibitions.